There are a variety of ways to predict the future. You can look at the data and extrapolate. You can look at the qualitative trends and imagine. You can look at today’s lead users as tomorrow’s mainstream. You can look at other industries and translate it to yours. So, how can we envision what the workplace of the future is like? One way forward that combines many of these approaches is to realize that today’s academic library is tomorrow’s workplace. In the most obvious sense, today’s students are tomorrow’s workforce. Though they may change a little, students’ motivations, behaviors, skills, and expectations will carry into the workplace. 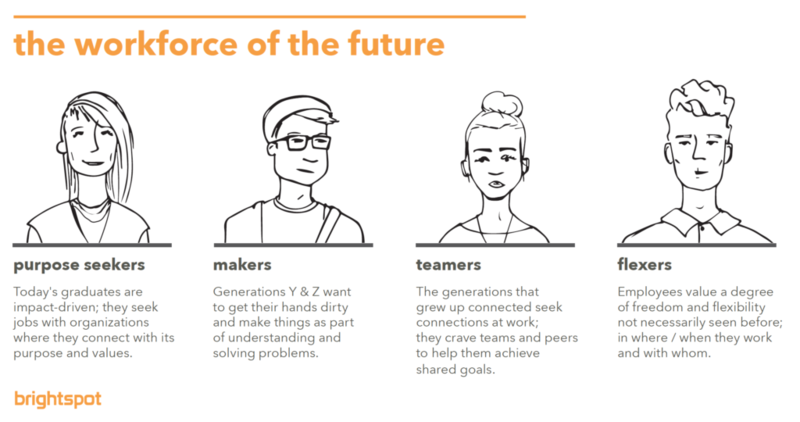 You can think about today’s students as impact-seekers, makers, teamers, and flexers. They are impact driven and want to work on projects that make a difference. They are creating more—videos, presentations, prototypes—in addition to traditional papers. They are working across disciplines, in teams. They expect flexibility and freedom of choice in their tools, spaces, and work. What is a 21st Century Library? Beyond accommodating this future workforce, there are attributes of today’s libraries that chart a course for tomorrow’s workplace. 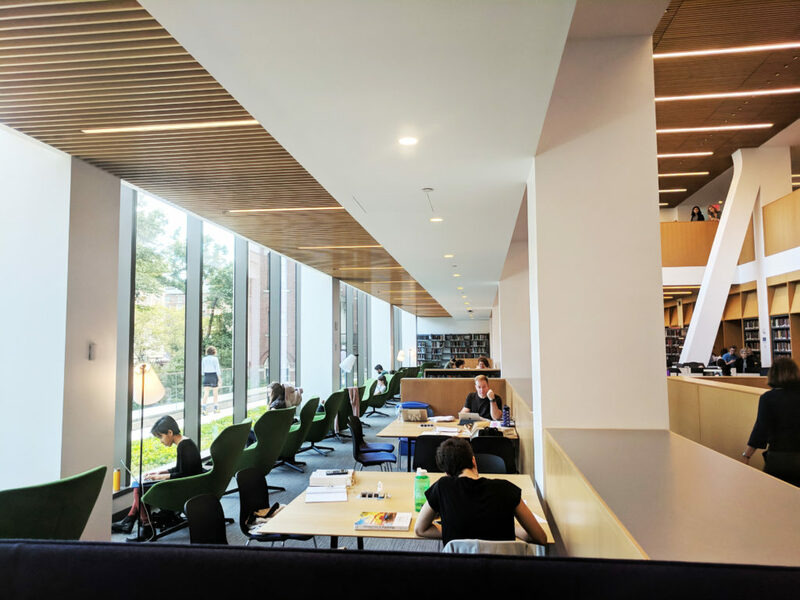 A 21st Century academic library is not only a place to access information individually; it’s now a place to connect, create, and share that brings together spaces, services, technology, and information for people – individually and in teams. To fulfill this expanded mission, today’s successful libraries are hybrid physical/digital places of variety, making, teamwork, showcasing, and skill-building that are all in service of making an impact. 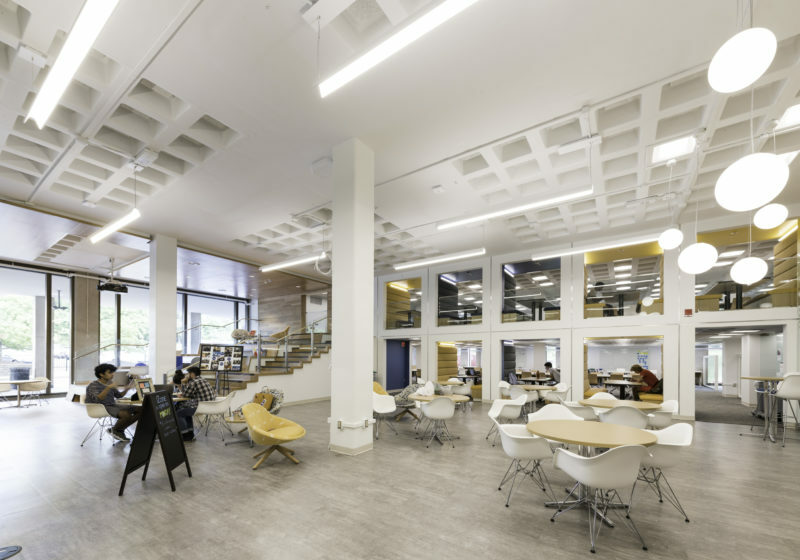 How Can Workplaces Learn from Libraries? Each of these aspects can be thought of as the guiding principles for a future workplace. To understand their origins in libraries and illustrate, let’s go through examples of brightspot’s work with over 40 academic libraries. Variety – Libraries provide a variety of environments in terms of size, atmosphere, location, furniture, and technology so that students can find what suits their work style and the work to be done. The Hunt Library at NC State University has dozens of different spaces: a quiet reading room, group study rooms, lounge spaces, data visualization spaces, recording studios, gaming labs, makerspaces, and terraces. In the workplace, this will mean expanding beyond just desks, offices, and meeting rooms to include cafes, lounges, labs, quiet zones, terraces and everything in between. Making – While in the past, students predominantly wrote papers and took tests, now project work plays a big role and those projects result in videos, apps, websites, skits, and prototypes. So, students are making things digitally and physically. At Barnard College’s Milstein Teaching and Learning Center, making is front and center with makerspace for rapid prototyping and a media studio with a green screen both near the building entry. In the workplace, this might include spaces like innovation labs, hardware labs, and fabrication shops. Teamwork – Quiet space remains a valuable resource on every campus, but libraries also provide a variety of environments to collaborate on projects in hands-on ways. As part of Georgia Tech’s library renewal, there will be a range of project spaces not just in terms of size and atmosphere but the duration of use. Some project work happens in an hour, and other times a room needs to be dedicated for a day, a week, or more, with work up on the walls. In the workplace, this could include flipping the model to assign spaces to projects rather than people so they report to a project room where all their work is up on the walls and they can be together. Showcasing – The more digital things become, often the more invisible they become. At the same time, people have always come to libraries for inspiration – and they always will. So, a big job for today’s libraries is to make things more visible through exhibits, displays, and events. Hampshire College’s Knowledge Commons does a terrific job of this through exhibition spaces, study spaces nestled among books, and event programming in open spaces and classrooms. In the workplace, this might include gallery spaces that show off what the organization creates if it’s tangible or what their customers make with it if it’s more intangible like software. Skills – There’s growing recognition of how much learning occurs not only outside of the classroom but outside of the class. Libraries are often driving forces in this effort through the workshops and tutorials they provide. For instance, this fall alone, the University of Miami’s Learning Commons offered 24 different skills workshops, ranging from statistical software tutorials to writing and rewriting to getting published. In the workplace, this could mean getting rid of the”just in case” model of learning where everyone goes through a rigid orientation or training but then may not be able to apply what they’ve learned for months or years. Instead, organizations can move to a “just in time” model where they learn at the moment of need – say through coaching or self-paced e-learning – in more informal and flexible spaces. Services – Space and information aren’t enough; today’s libraries provide a range of services as well. These include food, room booking, consultations with experts, equipment checkout and tutorials, technology support, and event programming – to name a few. The University of Virginia’s Georges Student Center within Clemons Library brings these services together in a place that flexibly combines studying and getting help. In the workplace, this is already changing the model as coworking and serviced offices have created a new category of “space as a service” that are typically paid for on a monthly subscription basis and offer food, community events, tech support, and shared spaces. Impact – The right spaces, services, technology, and staffing exist not for their own sake but for students and faculty to make an impact, to pursue projects with purpose. These are now called “renewable” assignments as they are likely to keep student invested and thinking about them even after they are due. The University of Rochester created the Barbara Kruger iZone as a collaborative hub for students to solve problems, explore, and imagine ideas for social, cultural, community, and economic impact. In the workplace, this might take the form of more directly connecting employees to the company purpose and showing how they are contributing through the design and branding of the space but also through the exhibit and events that activate it. What does tomorrow’s workplace look like? Instead of looking into a crystal ball, I suggest looking at today’s best academic libraries – and Library Journal’s “New Landmark Libraries” is a good list to start with. When you do, you’ll find these libraries bring together a variety of spaces, support teamwork, enable digital and physical making, showcase people and their work, and build skills so students can solve problems and make an impact. Some workplaces already have aspects of this future. So now, let’s keep going to get the future workplace ready for the future workforce!